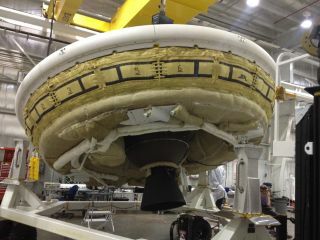 NASA is gearing up to test an inflatable, saucer-shaped vehicle that could help astronauts explore the surface of Mars. The space agency's Low-Density Supersonic Decelerator (LDSD) test vehicle is now fully assembled at the U.S. Navy's Pacific Missile Range Facility in Kauai, Hawaii — the site of its first flight trial, which is currently scheduled for June 3, officials said. One SIAD is 20 feet (6 m) wide, while the other measures 26 feet (8 m) across. They are designed to fit around the rim of an atmospheric entry vehicle, like the one that helped NASA's 1-ton Curiosity rover land safely on the Martian surface in August 2012. Curiosity is the heaviest object that has ever landed on Mars, and its mission pretty much maxed out the descent and landing capabilities of currently available technologies, NASA officials have said. LDSD hopes to raise that ceiling high enough to accommodate future human missions. On June 3, a balloon will carry a test vehicle equipped with the 20-foot SIAD and the huge parachute to an altitude of about 23 miles (37 kilometers). At that point, the vehicle will be released and its booster rocket will kick on, taking it to Mach 4 (four times the speed of sound) and 34 miles (55 km) up. The SIAD and big parachute will then deploy in succession, giving team members their first good look at how they perform in a Mars-like environment. (At such heights, the air is thin enough to be a good analogue for Mars' atmosphere, which is just 1 percent as dense as that of Earth). NASA plans to webcast the demo live, airing video captured by the LDSD test vehicle, officials said. "This first test is a true experimental flight test," LDSD principal investigator Ian Clark, of NASA's Jet Propulsion Laboratory in Pasadena, California, said in a statement. "Our goal is to get this first-of-its-kind test vehicle to operate correctly at very high speeds and very high altitudes." But something productive will come out of the flight even if all does not go according to plan on June 3, he added. "We are pushing the envelope on what we know," Clark said. "We are accepting higher risk with these test flights than we would with a space mission, such as the Mars Science Laboratory [the official name for Curiosity's mission]. We will learn a great deal even if these tests, conducted here in Earth's atmosphere at relatively low cost, fail to meet some of the mission objectives." NASA plans to conduct two more LDSD test flights from Hawaii in the summer of 2015, officials said.